At Northcote Primary, we believe teaching Philosophy for Children helps children to think, communicate and express themselves better. 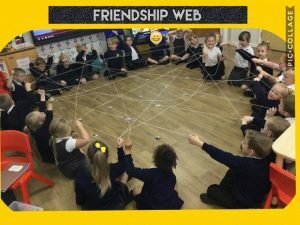 P4C helps to develop higher order thinking skills and helps children learn to co-operate with others. It promotes a forum for open dialogue in which students exchange and discuss ideas and opinions of their own and others. Pupils are encouraged to ask questions, sift arguments and explore alternative ideas. Above all, we encourage the students to try to understand each other. After the discussion the children and teacher reflect on the quality of the thinking, reasoning and participation. We then suggest how they could improve; either as individuals or as a group (community). If you have any questions about P4C then ask your class teacher or see Mrs Ashton (the P4C coordinator). Our Northcote Curriculum is designed with the intent to maximise the potential of all of our pupils; intellectually, socially, morally, emotionally and culturally. We take every opportunity to encourage a love for learning within all of our pupils, based around a resilience for learning and achieving greatness. Most importantly we allow our children to learn in a safe and stimulating environment, where their views are valued. Implementation – P4C is delivered as part as our Social values. 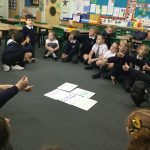 P4C promotes an enquiry based curriculum where pupils are encouraged to ask questions and find the answers through discussion of social values. Therefore, children develop the ability to recognise differences and explore these constructively. 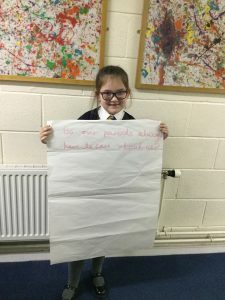 P4C is taught weekly through stand-alone lessons as well as through opportunities for purposeful cross curricular links. For example, in R.E we explore a wide variety of beliefs and cultures. In Shared reading for making right/wrong choices and consequences through stories e.g. Goldilocks and the three bears. 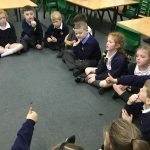 P4C plays a vital part in our mission to promote the development of vocabulary by giving children engaging topics to discuss. 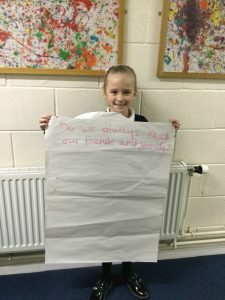 The approach fostered through P4C will help to develop higher levels of self-esteem and intellectual confidence for both KS1 and KS2 children. 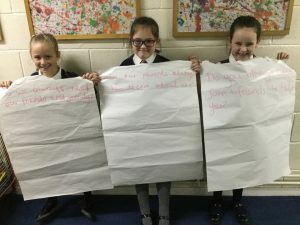 Pupils learn the skills to be clear in their thinking so that they can explain their ideas, give good reasons for their views and develop their vocabulary. It teaches patience, respect to others and a better understanding of the world around us. It has been part of the Northcote Curriculum for three years. All teachers have had relevant training and a wealth of experience in delivering the lessons. We promote a ‘sharing of good practise’ throughout the school with less experienced teachers watching how effective P4C is delivered by more experienced practitioners. Our school works in collaboration with 6 other local schools; here the subject leaders meet and discuss aspects of the P4C curriculum, sharing good practice and ideas for purposeful teaching and learning. 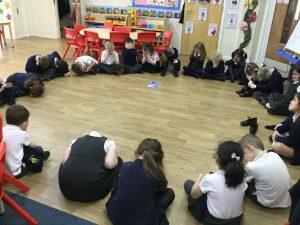 A typical philosophy lesson starts with a game and then the children being given a stimulus, such as a picture book, a video or a piece of music or art. They will create a list of philosophical questions inspired by the stimulus – anything from, ‘Are friends more important than family?’ to, ‘Is it ever okay to steal?’ – and vote on which one to talk about. The class then has an ‘enquiry’ – an open dialogue – around that question. Our Social Values Curriculum promotes good morals and values. This is celebrated in assemblies through our Code of Conduct award each week. P4C learning is evidenced through floor books which will feature photographs of the children taking part in the lessons. Each lesson finishes with a debrief of enquiry. Here the children decide what has worked well and what could be improved. This is a fantastic opportunity for the children to self-assess themselves and their new learning and understanding. 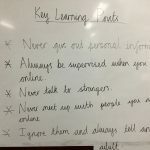 Each lesson builds on the previous and children’s skills are improved upon throughout each topic. 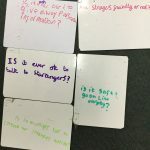 It is also clear to see the progression of skills throughout the school through the children’s ability to discuss complex questions. Subject and school leaders monitor the impact of our curriculum provision through completing regular monitoring, that includes listening to the voice of our children.